With the new blog setup, I thought I’d cheat a little and write a quick bit about the sloppiest “sewing” project I’ve done lately, just to get a feel for how the new platform is set up. This barely qualifies as sewing, so you have that disclaimer up front. Every year the kids’ school participates, as do many other schools, in Read Across America Week. Every day for that week has a dress-up theme, including one day where the kids are invited to dress up as their favorite book characters. Every year so far I’ve said “no” to a day where Romeo runs around in tidy-whities and a cape a la Captain Underpants. 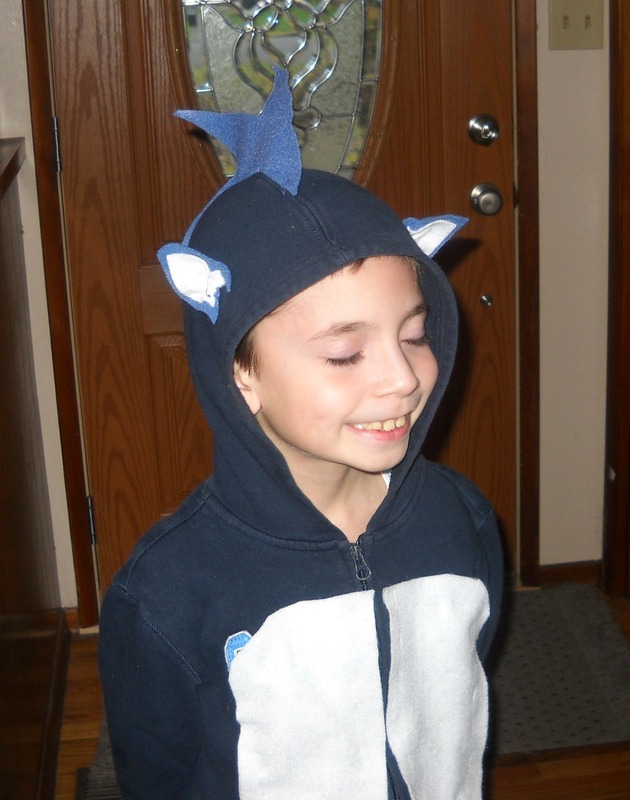 This year, he decided that Sonic the Hedgehog would be his chosen character. Yes, I realize that’s a video game and cartoon character, but he’s also been in numerous comic books over the years, some of which Romeo has been reading recently, so as far as we were concerned, he counted. I keep a bit of a felt stash for just these occasions. The felt won’t fray, so I don’t have to finish the edges. I took long running stitches, like 3/4 to 1 inch long to hold it onto a hoodie he had in his closet. The white felt of the “tummy” section hides the Old Navy logo. For Sonic, the ears and mohawk-like hair were the most distinguishing features I could find in a sea of Google Images. I used more felt cut roughly to shape and basted onto the hood. For the mohawk I had to alternate which side I was orienting my stitches to so that it would stay more or less standing up throughout his day. The ears are a little gathered where they are attached to give them some shape. I realize there are probably a million different ways to costume a child for a day at school, but this particular method is growing on me. You see, those long stitches are relatively easy to pull out, so I haven’t permanently wrecked repurposed his hoodie and he can keep wearing it as normal. All I have to do is pull out the basting stitches and I can keep the felt around in my stash for the next time he needs a costume in a hurry. (Maybe not all of the white felt tummy, they must have had spaghetti or chili or some such at school that day). In case you were wondering, I didn’t have to make a themed hoodie for Guinevere. She went as Pinkalicious. Next time I’ll have to take pictures before school instead of after. They didn’t seem to be able to keep their eyes open. I do the costumes for m daughters dance school, this year I did about 100 in about 12 different size ranges. You’re right it’s not couture sewing that’s for sure and ironically the hardest thing for me to do is to not over think a design! 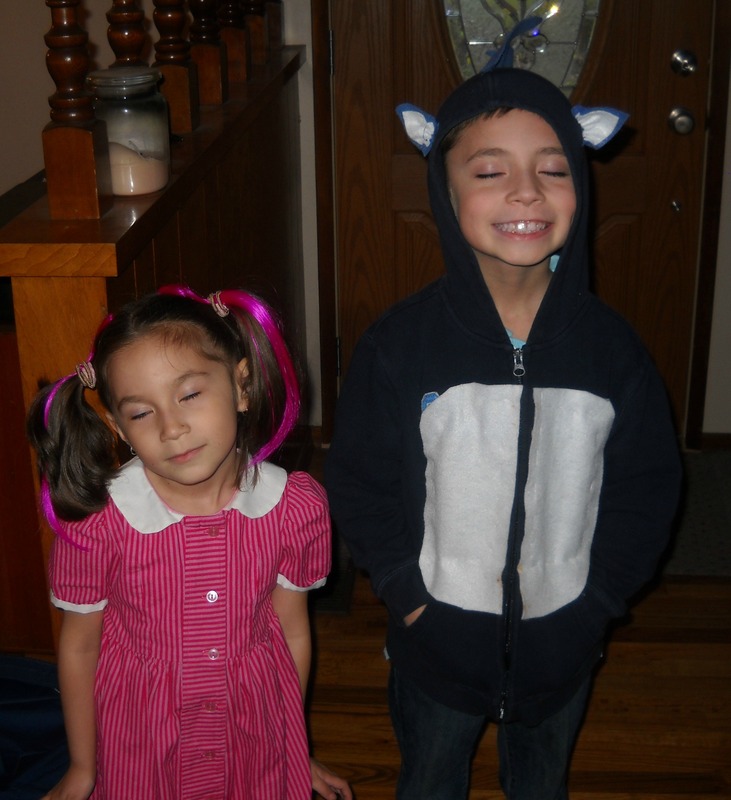 Your Sonic and Pinkalicious are so cute, even if they couldn’t keep their eyes open!